Virtually all Divorce Related Transactions including Attorney fees, 730 psychological Evaluations, Private (social worker) Mediation, Therapy, Supervision, and Child Exchanges are paid by Cash or Check, and sometimes by Credit Card. It is also important to realize that virtually NONE of this money is reported to the IRS simply because NONE of it is Tax Deductible. In addition, since almost none of these bills are paid by insurance (i.e. Blue Shield, Aetna, etc. ), therefore, almost no family court officials, and/or court-ordered Specifically Named Service Providers receive 1099 forms, since their bills are paid by cash or checks by divorcing parents. Therefore, at the end of each year the income that these people have received — often in the hundreds of thousands, if not millions, of dollars — may not be, and many think is NOT reported to the IRS since there is no way to audit them. 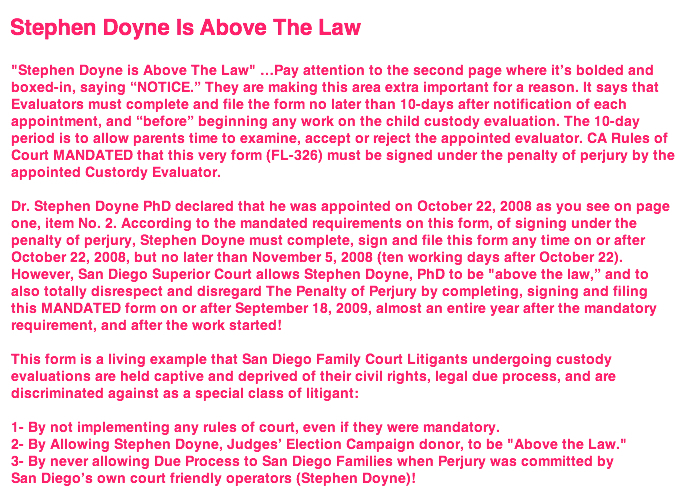 For example, Dr. Stephen Doyne PhD is known to have performed about 4000 custody evaluations in the last 25 years. So, for example, if he does approximately 150 evaluations a year with an average evaluation estimated to cost 15,000 dollars (? 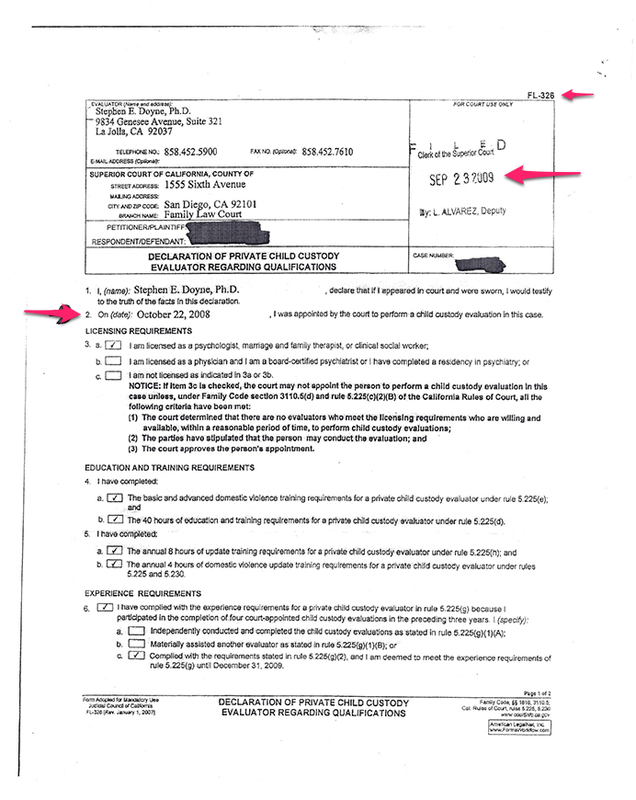 ), this amounts to $2,250,000.00 a year in income for this one evaluator. Note also that this does not include other services that they may provide: such as therapy, mediation, lectures, etc. In the absence of FL326 and/or FL327 forms that were both mandated to be filed at the clerk’s office at the court house, a paper trail vacuum was created, and thus the IRS and State Franchise Tax Board have no way to accurately audit these officials for tax years 2001-2009. 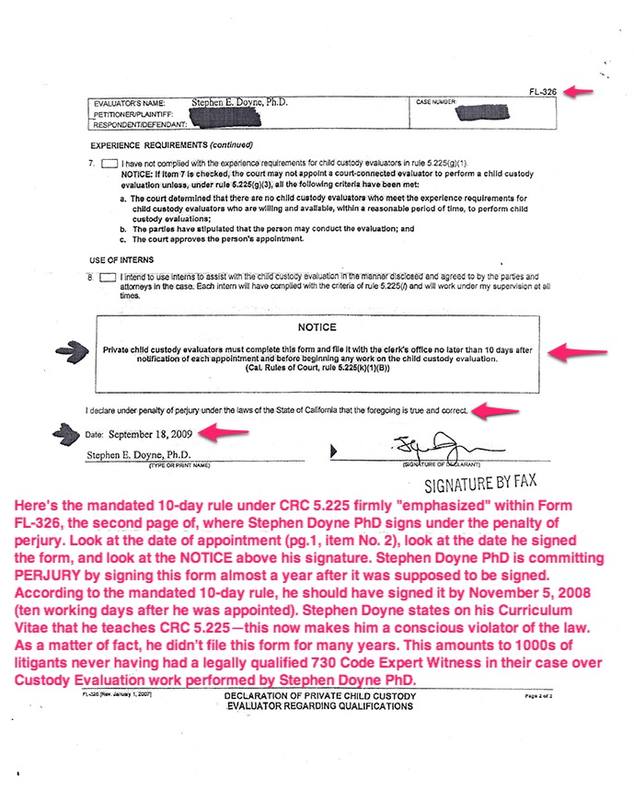 And to this date, Nobody in the San Diego Family court system has been held to account for this in the least bit: other than that — because a Robbed and Abused parent discovered the ‘oversight’ and complained (to other parents: who then went public) — the San Diego court was pressured to recently implement rules that were strongly advised in 2001, and mandatory in 2005.